The Onsen has 25 villas or ‘ryokans’ resort style overlooking a serene scenery. It is available in 2 or 3 bedrooms for your convenience. Feel transformed, once you step into your villa. The beautiful wooden villa or ryokan has been designed with a real Japanese ambience. Enjoy our ‘Yukata’ robe, tea setting, tatami flooring, the comfortable beds and of course your private natural hot spring bath. Soak yourself into a truly serene bathing and enjoy the fresh air in your own balcony overlooking a green mountainous scenery. If you just want to enjoy our Onsen , we will provide you a public onsen consisting of two separate onsen pools : male and female, each of which can accommodate 20 persons. 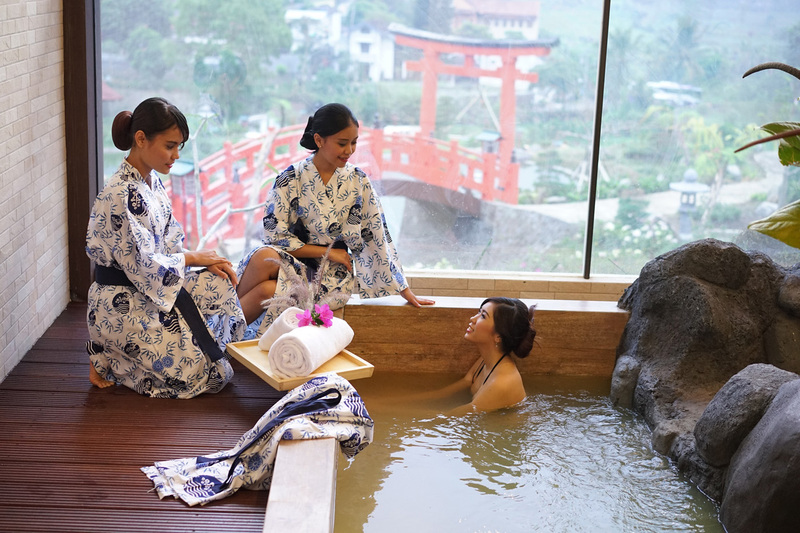 You can also enjoy the beautiful scenery while soaking yourself at the onsen and this will lead you to the true Japanese bathing culture and experience.